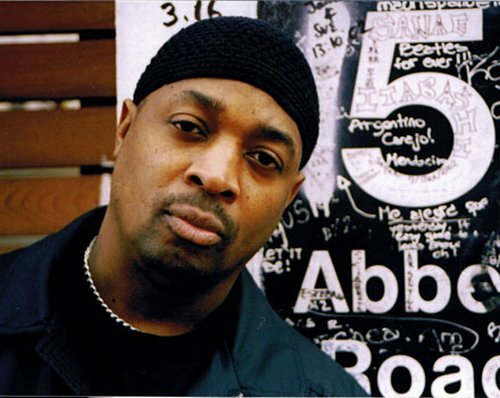 Chuck D is a rapper, author, producer, activist, and leader of the musically and politically revolutionary group Public Enemy. In 2009 he launched hiphopgods.com, whose tagline is “where classic rap lives on.” We spoke on the phone from his house north of Los Angeles, where he lives with his wife, Gaye Theresa Johnson, an assistant professor of Black Studies at UC Santa Barbara, and their newborn baby. Q: You’re among the first generation of hip hop artists to move into midlife. Is the rap world a happy place for older artists? A: Well, I came in as an older person. On my first record I was 27 years old, and at that particular time if you were over 18, 19, I mean, I came in ancient, and I’m the fifth oldest in the group. Flav is a year older than me. He was born in 1959. And me and Griff were born on the same day. We always say the fact is you’ve just got to be yourself. We grew up fans of Stevie Wonder and Teddy Pendergrass, Marvin Gaye, the Tempations, all these people that were older than us, but we didn’t know how old they were. All we knew was they put out good music. People like the Jackson Five and the Sylvers, groups that they designed for kids, they were the exception, they weren’t the rule. Q: What about now? Is rap still a young person’s game? A: It depends. If you look at major record labels as being the beginning and end of it all, with the bottom line saying who is what, yeah. But in the Internet age it’s an impossible thing to call, because artists of all ages are doing things across the board, and it’s no different in hip hop. The genre is 30 years old as recorded music. Does somebody who liked hip hop at 25 have to automatically graduate to jazz? Rock and roll is a 50-some-odd-year documented genre. Somebody who was 12 in 1956 with Little Richard is close to 70. Does that take them out of rock and roll? The thing that makes this different from any other time in the past is an eight-year-old has access to the archives of history. So you see a young kid with a shirt that says “The Beatles.” What is that about? Q: It’s about access, like you said. Speaking of which, a couple of years ago you started a website, hiphopgods.com. What are you hoping to do there? A: I was influenced growing up in the ’70s by classic rock radio. It put a little attention and focus to the beginnings of what they considered rock and roll. They had the Beatles, they had Chuck Berry, Led Zeppelin, Traffic. And while the mainstream in the mid-’70s dealt with the Aersomiths and the Bostons and Meatloafs and the Framptons, classic rock radio found a niche. So I wanted to do the same thing for rap and hip hop, ’cause I know there’s artists still cutting music, still making videos. They have their own structures. They might not be signed to a major record label. Putting your art with a major record label today is like buying your family tickets on the Hindenburg. So these artists, they’re performing, they’re recording, but they’re kind of in an isolated abyss so I wanted to put together an infrastructure online that corralled all these efforts and put the focus on where they’re at as artists and not on competing. It’s almost like golf. You never see Jack Nicklaus play with Tiger Woods. So it’s like the senior circuit. And it happens to be a bigger industry than the mainstream, ’cause the mainstream has to spend millions and millions and millions on branding artists. Artists qualify for Hip Hop Gods if they have 15 years of experience in the marketplace, and that means your career had to start in 1996 to be eligible. Tenure is a very important part of what we consider to be the craft of hip hop. Q: How has your approach to craft changed over the years? A: Technology has allowed us to be different. People say, “Oh, you’re in the studio now?” and they’re thinking, like, eight people are in there. But you’ve got the studio on your phone. I have a studio in my laptop. You can be in Siberia and still be in the same session with someone in East St. Louis and someone in San Francisco, passing around vocals. When the music went from analog to digital it created a new space, a new idea of what the studio is. Albums are from another period. Radio stations have metastasized across the web, word gets around on people’s Facebook pages, on Twitter. You can a song in an instant and get it out there really quick. You can look at something and make a song about it and have everybody hear it the next day. The immediacy is different. What you’re making and the type of music that you’re doing has a different context than it did 15 or 20 years ago. It’s a lot better for those that understand and people that don’t understand, they don’t have a context to put it in. When I came in to the studio in order for us to make some of those mixes, you had to have four people pushing up faders on the 24-track or 48-track. Today you can make a lot of those things on your laptop. Q: Is that all good? Is there a downside? A: The downside is when you’re lazy, and you can’t make comparisons of eras and you don’t have perspective. Music goes forward but you’ve got to have a sense of the historical timeline that allows you to do what you do in the first place. When I go into a session sometimes I’m thinking about Fats Domino going into the studio with one mic. How was he thinking? Or when the Beatles were in the studio experimenting, you’ve got to know what the experiment was. What worked? What didn’t work? You’ve got to know the environment, the history, the technology, the genres. At the end of the day music is music and it’s all about one track, but the sum of all parts is what’s missing today, ’cause people are so caught up in the end result and what it’s going to bring. You’ve got to take the sum of all parts into consideration. A: 24 years going on 25. Q: What are the challenges to staying intact, let alone fresh? How do you do it? A: You’ve got to provide opportunities across the board. We have extended membership, we have people who’ve retired, people move in, move out. I’ve kept an open door policy for 25 years. You have to consider people’s contributions, and you have to lead and be open to everybody’s wants, needs, and grievances. We live in eight different parts of the country. I think if Public Enemy was never a group that went across 77 countries over 24 years, if we were contained like most hip hop artists are and were just a United States thing, we wouldn’t have lasted long. Because we were able to use the entire world as our palette, it kept us working, and we were able to plan out our pace. You’ve got to move at your pace. You can’t move at someone else’s pace, be it a company or an industry. The recording industry collapsed because it always seemed to be in a perpetual race against itself. We set our own pace. We all have our families, our businesses, we’re not going to get in a situation where we’re going to be away from our homes for two months. We set limits a long time ago. We define what a tour is for us. Internationally it’s no more than 14 or 15 days and domestically no more than 20 days to make sure that you can bounce back and pick up where you left off kind of easily.